There’s no doubt that an extra copy of chromosome 21 is what causes Down syndrome. There’s a lot of doubt, however, over which particular gene—or combination of genes—on chromosome 21 is the actual cause of its symptoms. To flesh out our understanding, geneticists must grapple with this large chunk of the genome that includes more than 200 genes. How many of these genes contribute to the Down phenotype? Which are the most important? What are their roles? Studies in mice and other animals have uncovered clues about the function of a few of the genes on chromosome 21, but many remain understudied. In G3: Genes|Genomes|Genetics, Nordquist et al. used Caenorhabditis elegans to systematically investigate the function of these genes and identified some that could play previously overlooked roles in nervous system function. Because C. elegans has a simple nervous system and can be genetically manipulated quickly, the authors were able to screen dozens of genes—many more than were practical in previous studies using mice. After investigating which human chromosome 21 orthologues may be essential for C. elegans survival, they studied 27 nonessential genes using existing mutant strains. Because people with Down Syndrome experience a variety of neurological and neuromuscular symptoms, the authors evaluated the worm mutants through a battery of tests for muscular and neurological function. 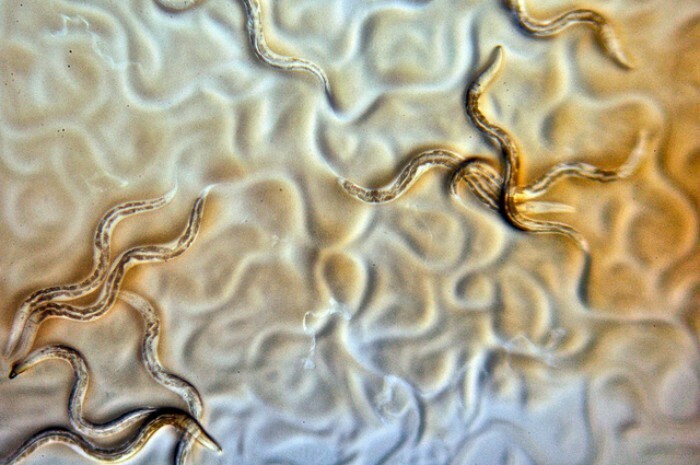 Ten C. elegans orthologs, when mutated, impaired the worms’ locomotion and nervous system. Several of these are known to be important for neural development in worms—for example, the gene cle-1 is needed for axon guidance. Three of the genes the authors identified had not been previously linked to the nervous system, and little to nothing is known about these genes’ functions. These results are just the beginning. To reveal their role—if any—in human disease, the genes identified will need to be studied further. But our best bet for understanding the complex genetics underlying Down syndrome is to use a wide variety of tools, including the lowly but powerful worm.